Create to send Happy Navaratr Message of Good Wishes to have blessing of 'Maa Durga' with names. 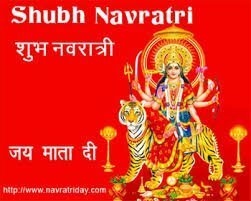 You can also send your good wishes as per Navratri Days Wise 'Avtaar' of "Maa Durga" we worship. Delete or Enter Names (Top Receiver / Bottom Your) in boxes provided for this. Press Buttun Preview to see Preview to check your typed content. Cilck Button Download to save the message in your device. Navaratri Day Wise 'Avtaar' of "Maa Durga"